At a time when the world seems to be confronted by challenges that are uniquely modern, like the threat posed by climate change* (which for my money is our greatest looming crisis), or globalized Islamic extremism, or America’s massive worldwide surveillance network, we shouldn’t lose sight of old problems that still cause considerable grief even in the year 2013. Specifically I’m talking about the problem of borders drawn quickly and poorly, a century or more ago, by European colonial powers, that even today are, if not the specific causes of conflict, at least a significant contributing factor to conflict. A couple of months ago there was a piece in The Atlantic by Nick Danforth, who runs a very interesting blog on maps and the Middle East here, arguing that it was wrong to blame colonial borders for “the Middle East’s problems.” It’s a good piece, and he’s right that there’s no particular reason to believe that differently drawn borders would have precluded any or all Middle Eastern conflict since then, but I was kind of left wondering, like Joshua Keating at Slate, who exactly had been blaming the Middle East’s problems solely on colonial borders in the first place (aside from The Daily Show, I guess). These border issues are like the Sunni-Shiʿi divide, in the sense that it would be wrong to attribute any of the current Middle Eastern conflicts either to sectarian hostility or poorly-conceived borders (and, as Danforth notes, the racial and confessional preferences shown by the European colonizers were easily more destructive than the badly-drawn borders), but both are contributing factors to the intransigence and intensity of those conflicts. There are five that I want to talk about here, a couple of which are directly addressed in Danforth’s piece and Keating’s response, so I’ll reference those where appropriate. These are all examples from the Middle East-Central Asia region; there are undoubtedly more and better examples in Africa (Rwanda and the Congo, maybe? ), but you gotta stick with what you know, right? The border that theoretically separates Afghanistan from Pakistan is named for Sir Henry Mortimer Durand, a civil servant in late-19th century British India who negotiated the boundary with then-Afghan Emir Abdur Rahman Khan in 1893. For most of the 19th century, the Brits in India were engaged in geo-political maneuvering with the expanding Russian Empire (AKA “The Great Game”) for control of Central Asia and for the security of British India. At the same time they were engaged in an ongoing border conflict with the Afghans (who were more or less British allies in the wrangling with Russia but didn’t appreciate the way the Brits kept trying to draw the northwestern border of India further and further north) that occasionally flared up into outright war, as in the First Anglo-Afghan War from 1839-1842 and the Second Anglo-Afghan War from 1878-1880. The thing about the Durand Line is that there’s some geographic rationality behind it, seeing as how it runs through or up to the Hindu Kush mountain range that really marks the geographic border between central and south Asia. Britain wanted to control the Khyber Pass, the overland route through the Hindu Kush and down onto the Punjabi plain, because that was the easiest way to secure British India from potential Russian encroachment if the Russians ever made it that far south, but they weren’t particularly interested in claiming any territory north of the Hindu Kush because that would be considerably harder to defend from Russian advancement. The problem is that the Durand Line runs square through the middle of a region that has long belonged to the Pashtun, who were there well before the British showed up and were going to be there well after the British hit the road. Durand couldn’t have cared less about the integrity of some tribal population in the area, but his focus on the Khyber Pass and on making the Hindu Kush the northwestern border of British India left the Pashtun people divided. The Pashtun response ever since has been to refuse to recognize the legitimacy of the Afghan-Pakistan border altogether, and this even became official Afghan government policy in 1949. The impact of this disputed border is hard to overstate. It’s not the reason why Afghanistan is a mess, or why Pakistan is only slightly less of a mess, but it strongly contributes to the dysfunction of both countries. The government of Pakistan has very little real authority in the Pashtun region of the country, which is why the United States keeps asserting the right to strike suspected Al-Qaeda and Taliban targets there. Part of the reason the Taliban still hasn’t been contained by the United States or the Karzai government is because the porous border with Pakistan allows freedom of movement for men and materiel between the Pashtun areas of both countries. Had Durand created a separate “Pashtunistan” or drawn the border to incorporate the bulk of the Pashtun on one or the other side, it would have eliminated a considerable amount of instability over the past century or so. The Durand Line, as well as the current-day border, with the shaded blue area showing the Pashtun and Baluch areas that were divided by the line. While a great deal of thought went into the Durand Line, just none for the long-standing ethnic makeup of the region through which it ran, the border that was drawn separating the future Pakistan from the future India on the eve of independence from Britain, named for Sir Cyril Radcliffe, has been a problem because it was drawn with very little thought behind it at all. Radcliffe had been Director-General of the Ministry of Information during World War II, and that combined with his never having set one foot in India made him qualified, somehow, to oversee the incredibly difficult work of creating two new nation-states there. The British government gave him plenty of time to complete the job, like a whole five weeks, and that was probably more time than Radcliffe wanted; when he finally did make it to India to begin his duties, his initial impression was that he wanted to get the hell out of there as soon as humanly possible. The line Radcliffe wound up drawing made virtually no sense; it bifurcated villages and heavily populated regions, and there are even stories about it running through single houses. Radcliffe shrugged off complaints by arguing that somebody would have been unhappy no matter how he drew the border, but once independence came the true extent of the catastrophe that was Radcliffe’s shoddy work became apparent. About 14 million people immediately fled from one side of the border to another, and millions may have died in the chaos (estimates fluctuate wildly), while ongoing tensions over the border contributed to wars between India and Pakistan in 1947, 1965, and 1971. Radcliffe graciously refused his salary for a job mediocrely done…and then was given a lifetime peerage and made a Knight Grand Cross of the British Empire. Heck of a job, Cyril! Partition of India, including migrations after the partition. The real kicker, long-term, has been the fact that the Radcliffe Line made no allowance for the final status of Kashmir, the mostly mountainous region that serves as the northernmost tip of India and the northeastern part of Pakistan. The British authorities assumed that the last autonomous ruler of Kashmir, Hari Singh, would join Pakistan after the partition (Kashmiri independence was apparently not an option), because Kashmir’s population was overwhelmingly Muslim. Hari Singh surprised the British by refusing to join Pakistan and then appealing for British aid when Pakistani irregular fighters started pouring into Kashmir to, uh, encourage him to change his mind. He got British assistance, but the price was agreeing that Kashmir would become part of India, instead. A 1948 agreement to end the fighting left about half of Kashmir in Indian control, including the Valley of Kashmir, the most fertile part of the province and the home of the majority of its Muslim population, while Pakistan got about a third of the region, but mostly impoverished mountainous territory and little of any value. There’s no logical way to reconcile this division, since the valley’s geography and demographics would naturally put it in Pakistan. The inherent tension in this particular border has certainly contributed to subsequent border wars, is the better part of the ongoing tension between the two (now nuclear-armed) countries, and has provided plenty of grist for the international jihad mill. Oh, and part of the area is also disputed between India and China, which helped ignite the 1962 Sino-Indian War and has continued to cause tension in Indian-Chinese relations. Quick! What do the Iraqi government and the people trying to organize peace talks over Syria have in common? Wow, yeah, “ultimate futility” was a great guess, but in this case we were looking for a common enemy. Yes, the Islamic State of Iraq and Syria, that plucky band of Sunni takfir extremists who are nominally aligned with Al-Qaeda, have rejected any negotiated settlement in Syria, and are perpetrating violence in Syria and Iraq on a regular basis. Bruce Reidel, from Brookings, has called the Iraq-Syria border region Al-Qaeda’s “most dangerous stronghold ever,” which seems a little hyperbolic (ISIS really is only nominally affiliated with Al-Qaeda–its leader Abu Bakr al-Baghdadi isn’t taking orders from Al-Qaeda Central–and ISIS doesn’t yet seem to have made any effort to attack targets outside the Syria-Iraq region, so I’d argue that Yemen is a more critical area for Al-Qaeda as a whole right now) but does reflect the degree to which the border area has been a good home for the terrorist group. ISIS’ ability to operate in both countries, indeed for their fighters to flow rather freely across the border between the two countries, is in no small measure due to the fact that the border itself was drawn with no concern for local realities, or really, anything other than getting that whole silly border-drawing thing over with as quickly as possible. When WWI was winding down, the French and British naturally set to the task of figuring out how they could divvy up all those ripe former Ottoman lands, and two men, Sir Mark Sykes on the British side and François-Edouard Picot on the French Side, were in charge of the negotiations. The story goes, and I assume it’s true because the line is right there on the map, that Sykes was briefing British Foreign Secretary Lord Arthur Balfour about his plans for the talks with Picot, and Balfour asked him how he wanted to divide the Middle East. Sykes looked at his map (I like to think he was yawning while he did it) and proposed a straight line from the “e” in Acre to the “k” in Kirkuk, and, well, that’s basically what you’re looking at when you look at a map of the Syria-Iraq border. Everything north of that line, modern Syria and Lebanon, became the French Mandate and everything south of it, modern Israel/Palestine, Jordan, and (sort of) Iraq, went to the Brits. The big exception was the area around Mosul, which is north of the line and should have been part of Syria; the Brits renegotiated with the French to have it included in Iraq after they found out there was oil in them thar hills hot semi-arid fields (the French were a lot more interested in Mediterranean ports than they were in oil, an attitude that I think helps to explain many of the things that happened to France in the decades following the end of WWI). Leaving aside the fact that even talking about divvying up the former Ottoman lands violated the deal the British had made with Sharif Hussein and his army when they were fomenting the Arab Revolt against the Ottomans, you can’t look at a map, draw a straight line across it with no thought to the real people and geography represented by that map, and expect that line to serve as a stable national boundary. In this case, the line between Syria and Iraq runs through mostly desert, a geographic barrier to someone trying to travel overland from, say, Baghdad to Damascus, but no barrier at all for the Arab (now Sunni) tribes that began to occupy that region even before Muhammad began preaching what would become Islam in 7th century Arabia. Sykes-Picot and the actions of the European powers during the Mandate period helped to create the conditions by which the war in Syria has metastasized and impacted the entire region, crossing into Iraq via the Sunni tribes straddling that border and moving into Lebanon (see below), where no historic border had ever existed. It seems that even if many or most Lebanese citizens would like their country to escape from Syria’s orbit, they just can’t do it. Whether you’re talking about the Syrian military occupation of Lebanon, which lasted for 30 years from 1976 to 2005, or the inexorable and tragic widening of Syria’s civil war to encompass Lebanon as well, Lebanon is inevitably affected by whatever is happening across its very porous border with its neighbor to the north and east. The reason has a lot to do with the fact that, before 1888, the region we know as Lebanon was actually a part of Syria, or rather a part of the provinces that made up the area we know as Syria. Lebanon has historically been a part of “Greater Syria,” or Bilad al-Sham in traditional parlance, which is a region that basically encompasses the entire Levant (modern Syria, Lebanon, Jordan and Israel/Palestine, and the western part of Iraq as you already know). The Ottomans divided this whole region into administrative provinces, usually centered around a single large city, known as Eyalets and later, after a 19th century reorganization, as Vilayets. What we know as Syria was eventually cobbled together out of parts of the Vilayets of Aleppo, Damascus, and Deir al-Zor, but it always included Lebanon until the Ottomans recognized a new Vilayet around Beirut, which was becoming something of a boom town thanks to heavy maritime traffic, in 1888. What the Ottomans had done prior to the formation of the Vilayet of Beirut was to carve out smaller autonomous units on the Mediterranean coast of the Syrian provinces to accommodate two religious minorities: Maronite Christians and the Druze. When the French were given the Mandate for Syria and the Lebanon after WWI, “the Lebanon” referred mostly to these autonomous areas along the coast that were of particular importance to the French (especially the Maronite Christian areas). Once the French had won the Franco-Syrian War of 1920 and firmly established their control over the Mandate, they divided the territory into smaller administrative units, sort of as the Ottomans had done but with a greater focus on confessional identity as a basis for political division (so there was the Maronite zone that became Lebanon, and also an Alawite region and a Druze region along with the two large regions around Damascus and Aleppo). They created “Greater Lebanon” out of the Maronite area on the coast combined with a considerable amount of surrounding Arab/Muslim territory, and made sure to cultivate the province’s autonomy as a way to shelter the Maronites. The Maronites naturally opposed reintegrating this “Lebanon” into a united Syria, and Muslims living in Greater Lebanon were promised full participation in its government so that they, too, supported separation (or at least had no reason to oppose it). The other provinces were united into Syria (well, except for Hatay, which was eventually lost to Turkey) in the 1920s and 1930s, but Lebanon remained separate and won independence as its own nation. Unfortunately for Lebanon, a century or so of autonomy and at least nominal independence from the rest of Syria hasn’t really been able to overcome the millennium or so of shared history and interconnected development between the two nations, and Lebanon’s “border” with Syria is nearly as porous as it was back when there was no border there at all. This doesn’t represent a failure to draw borders properly so much as it represents a failure to draw them at all. The Treaty of Sevres between the Allies and the Ottoman Empire in 1920 proposed a Kurdish state entirely within the modern borders of Turkey. This obviously would have been inadequate to the size and geographic scope of the Kurdish nation, and was punitively designed to punish the Turks while leaving untouched the Kurdish-majority regions of Iraq (coincidentally** slated to come under British mandate), Syria (coincidentally** slated to come under French mandate), and Iran (coincidentally** well under British and Russian, but mostly British, hegemony). Sevres was accepted by all parties–the Ottoman royals and the European powers–except, you know, the Turks themselves. The Turkish resistance formed itself into the Turkish National Movement under the leadership of Musfata Kemal Ataturk, and spent the next couple of years fighting the Turkish War of Independence and laying a whupping on the Allied-backed Greek army and the Russian-backed Armenian and Georgian armies that were attempting to carve off pieces of former Ottoman territory in Anatolia. The Europeans lacked any desire to really put down this Turkish independence movement and wound up scrapping the terms of Sevres in favor of the 1923 Treaty of Lausanne, which simply confirmed Turkish sovereignty within the established borders of Anatolia (plus Istanbul’s European half). Lausanne was overall the right thing to do; it avoided more fighting and brought stability to the Turkish population of the former Ottoman Empire, who looked on their way to being completely dispossessed in the aftermath of World War I, but the failure to do something to account for Kurdish nationalism is a definite mark against it. 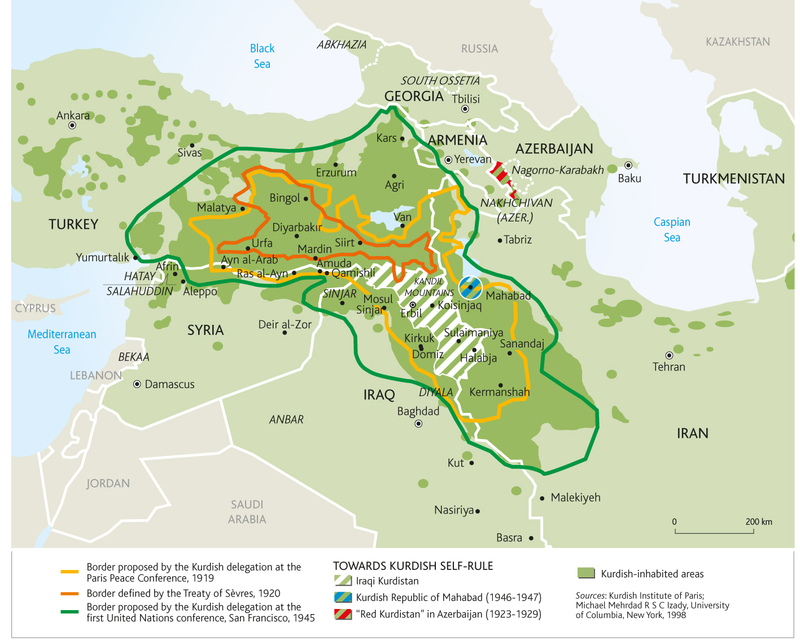 Decades of rebellion, oppression, and atrocities committed by both government and Kurdish forces in both Turkey and Iraq could have been avoided if some kind of independent homeland respecting the existence of the Kurdish nation had been established following WWI. Again, none of this is meant to lay the causes of the current instability in the Middle East or Central-South Asia on the poor or sloppy job that European colonizers did in drawing national boundaries. Nor is it to suggest that things would be better if the borders had been tightly drawn to reflect ethnic or confessional realities (which would’ve turned the region into a bunch of small pockets of Christians and Shiʿa swimming in a vast ocean of Sunni areas), or if no borders had been drawn at all (some kind of unified pan-Arab empire was also an option after the Ottomans fell). Rather, we should simply be aware that these borders, porous as many of them are, do contribute to the complexity of modern instability. I don’t know if there’s really anything to the Squiggly Border Theory, but I do know that these particular borders are problematic. * I don’t mean that climate change is particularly modern in its origins, but it is modern in terms of world interest and in terms of the kinds of solutions that it will require. BRILLIANT! Such a joy, to have all this good stuff served up in one convenient package.